For keeping the quality and effect of tunable LED lighting used in human centric lighting applications, a new research proposed novel methods to overcome the challenges of temperature change and lumen decay of LEDs. The research team demonstrated a system to maintain consistency and stability of LED light source over an extended period of time. Featured with tunable color temperature and spectrum, LED has been increasingly adopted in the developing human centric lighting applications in medical, educational and working environment for improving human well-being. Some of these applications require highly precise light spectra that don't produce optical power variations or shifts in color over time. Temperature changes and age-based deterioration are two challenges of LED when meeting the requirements of human centric lighting applications. The researchers thus addressed the challenges and developed a self-monitoring method to ensure the consistency of LED light emission. 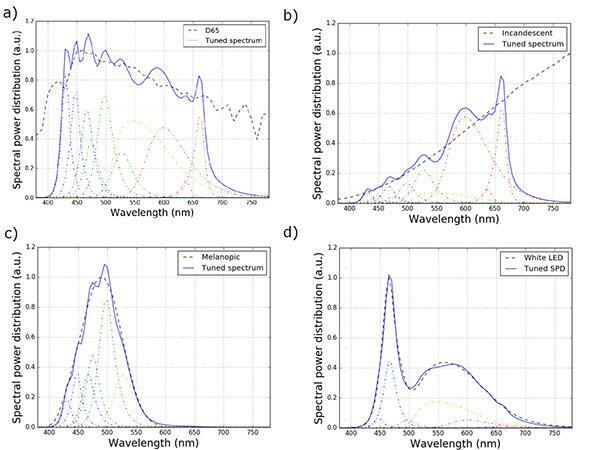 The research, titled “Arbitrary Spectral Matching Using Multi-LED Lighting Systems,” was published in the SPIE journal Optical Engineering on March 29, 2019. In the paper, the authors announced a two-pronged approach to both measure and self-adjust the spectral power distributions (SPDs) of LED lighting systems. A fast-computation and high spectral fidelity algorithm was used to determine channel weights of a targeted SPD. In conjunction with that method, an internal microprocessor provides a closed-loop control system that monitors and corrects the spectral output, compensating for shifts due to temperature changes. Aleix Llenas and Michael T. Eismann, authors of the research articles, addressed that with the method, they hope to develop a general framework for multi-channel SSL systems to ensure the universal applicability of their findings across different lighting technologies.